Scroll down for a participatory opportunity to wreak some comedic havoc on the bizarre twitter dating scene. But first a little history and inspiration. Not too too long ago the phrase calling card meant something different. Now that we have phones and internety devices at the ready, the calling card is gone, but it now has a replacement. And its free with your response to an Evite event right now (you might get a cupcake coupon instead). Better than "What's Your Sign?" 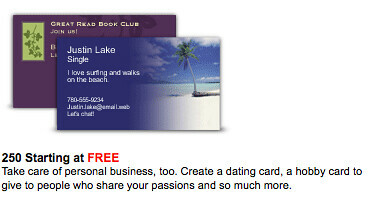 What the hell is a dating card for that a business card can’t achieve, you ask? And who would date someone that has 250 of these? We’d like to know too! Someone, please use these. Please. Order here, and tell us how it goes. Or, if that’s too intensive, help us live out the promise of the card. The email address and phone number for our dear desperate friend Chad Fulton clearly don’t work, and there is no @chadfulton99 on Twitter. Well, there WAS no @chadfulton99. But there is now Absurders. 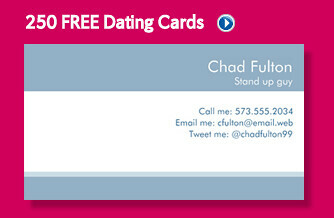 If you’d like to follow this intrepid card-carrying love hunter, just head on over to twitter.com/chadfulton99 and check out what he’s up to, and the impressive ladies he’s now following. Please do note that Chad’s card says “tweet me” thus indicating his view on twitter terminology. Buy your dating cards now! Here’s an equally silly variation on the “dating card” but withouth the bonus of being free, and therefore, even less likely to succeed. It’s an oldie but a goodie. Who doesn’t like a surrealist avocado commercial with a bonus shot of a pretty girl in a bikini. @absurddelight has inside information that this video won first prize in an ad contest, raking in a whopping $2,500 in cold hard check. Not bad eh? Here are a couple of the avocado entries that lost out: animated business avocados here, falling out of trees. Sadly, the full archive has been lost to the march of time. Sprite Bombs and Other Holiday Shopping Deals. Cool Neon is having a 2-for-1 holiday shopping sale on party starting luminescence. For some unknown reason, these babies are not illegal yet, so get’em while you can! Remember those small, paper wrapped bombs we enjoyed as kids? Well, a whole new generation of instantaneous explosive gratification has arrived!!! The name pretty much explains it: “Clear plastic frames with Cool Neon wire wrapped throughout the inside of the frames.” AA batteries not included. It has 16 preset colors including bright white at variable brightnesses and can cycle or morph trough all 16color and the 1000’s of colors in between. Let us know if you buy any of these. Thanks to Alex H. for the tip. Sometimes signs lie to us. Sometimes they confuse us. Sometimes they delight us with the effort that went into their permanent broadcast of meaninglessness. For the record: There were many items for more than 99¢, and though there were not any for less than 99¢, there were many that were 99¢ less than what we might pay elsewhere so that counts. 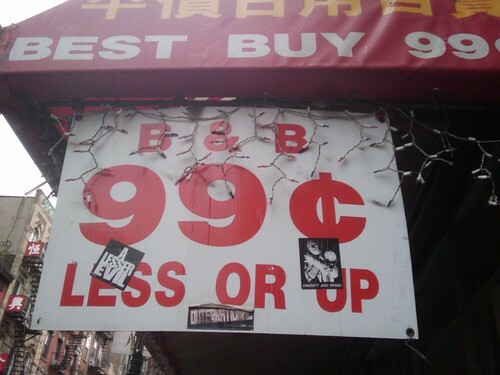 But some items were, in fact ,99¢. 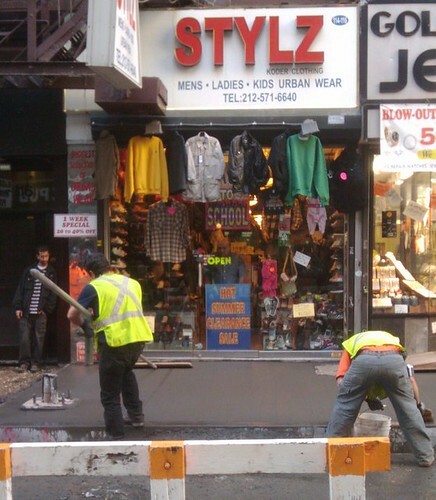 Now, this is a camera phone pic, so its a bit blurry, but we assure you, there is no smile on that shopkeeper’s face. If pressed for an adjective, let’s call him restlessly befuddled. A Big Waste of Time? You Decide. OK, this is nuts. We know. But it’s captivating so indulge in some details. 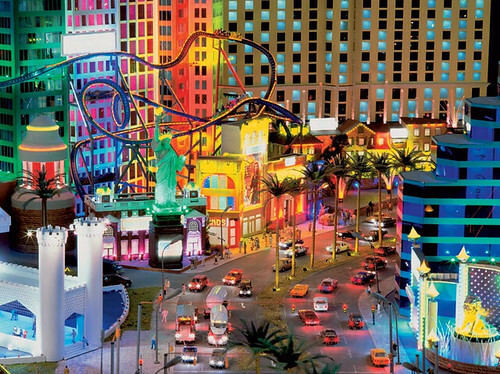 Here’s the worlds largest model train set … apparently one of the biggest tourist destinations in Germany, so forgive us if you’ve already fallen in love with Miniatur Wunderland. Exactly why is this absurd you ask? Mainly because it exists, but also because of how impressively thorough all the ancillary multimedia, behind the scenes tours, promotional products and business add-ons are. There are hotel and travel packages! Waiting time forecast charts! Good lord this is so German!